Sixth in a series about our adventures in Hokkaido this summer. 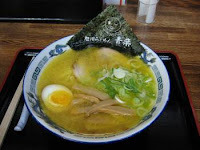 Ramen is one of Japan's favorite dishes. A simple concept - noodles in broth - nearly every prefecture and area serves a signature version, and each shop will feature a variation on this theme as well. Within about two blocks of our Tokyo apartment are at least three ramen shops, and each does the dish a little differently. One serves up a steaming bowl of noodles and fatty pork with a hint of green onion in a creamy broth. Another offers noodles with fatty pork in a clear broth with a strip of konbu and a nice selection of condiments - pickled daikon, dried garlic, a shaker of mixed spicy peppers, and a red paste that will warms you up from head to toe. Another, recently discovered noodle shop a couple blocks north of us serves it up with the usual noodles and pork, but throws in some seasonal vegetables, too. We finally settled on one that was crowded but didn't have a long line, and that looked cozy. A long list of different types of ramen, we finally settled on the most basic one. What we got was the usual steaming bowl, but this time it included "monogrammed" seaweed (I have no idea how that was done, but it's darn cute.) a soft boiled egg (a first time), the usual pork, and strips of mushroom. We happily slurped up the noodles from the rich creamy broth, while looking at photos of all the famous folk who'd dined there. While I can't say I thought this ramen was better than any other, I can say that it was as delicious and delightful as always. and that we left needing to loosen our belts a bit - as always!